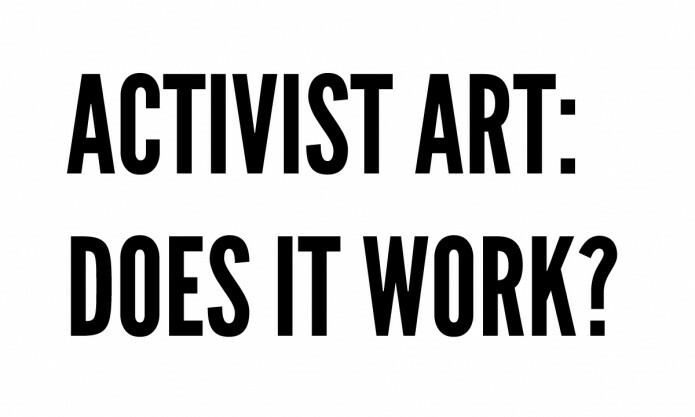 Stephen Duncombe and I published a column called “Activist Art: Does it Work?” for Open! Magazine. The first rule of guer ­illa war ­fare is to know the ter ­rain and use it to your ad ­vant ­age. The to ­po ­graphy on which the act ­iv ­ist fights may no longer be the moun ­tains of the Si ­erra Maes ­tra or the jungles of Vi ­et ­nam, but the les ­son still ap ­plies. Today, the polit ­ical land ­scape is one of signs and sym ­bols, story and spec ­tacle. Re ­spond ­ing to this new ter ­rain, there has been an up ­surge in the use of cre ­at ­ive, artistic, and cul ­tural strategies as a tool for so ­cial change. This prac ­tice goes by many names: polit ­ical art, act ­iv ­ist art, in ­ter ­ven ­tion ­ist art, so ­cially en ­gaged art, and so ­cial prac ­tice art. No mat ­ter the de ­scrip ­tion, artists are using their aes ­thetic train ­ing and skill to wage battles for so ­cial change. Yet as prac ­ti ­tion ­ers and train ­ers in these forms of artistic act ­iv ­ism, we are haunted by the ques ­tion: Does it work? Read the rest: Activist Art: Does it Work? | open!.